Opal is the product of seasonal rains that drenched dry ground in regions such as Australia’s semi-desert “outback.” The showers soaked deep into ancient underground rock, carrying dissolved silica (a compound of silicon and oxygen) downward. During dry periods, much of the water evaporated, leaving solid deposits of silica in the cracks and between the layers of underground sedimentary rock. The silica deposits formed opal. 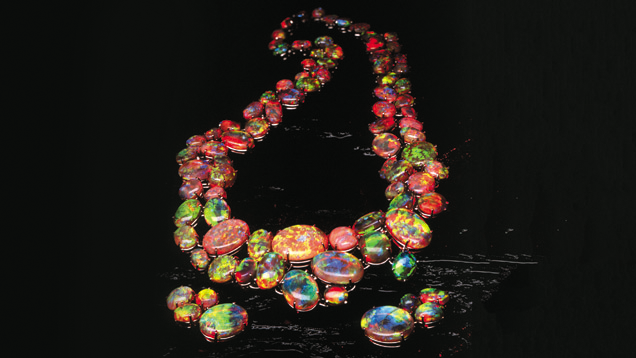 Opal is known for its unique display of flashing rainbow colors called play-of-color. There are two broad classes of opal: precious and common. 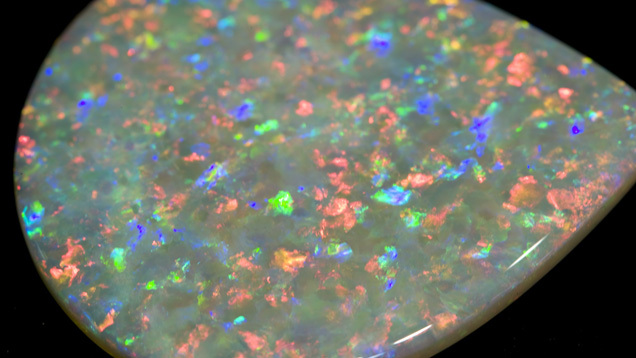 Precious opal displays play-of-color, common opal does not. Play-of-color occurs in precious opal because it’s made up of sub-microscopic spheres stacked in a grid-like pattern—like layers of Ping-Pong balls in a box. As the lightwaves travel between the spheres, the waves diffract, or bend. As they bend, they break up into the colors of the rainbow, called spectral colors. Play-of-color is the result. The color you see varies with the sizes of the spheres. Spheres that are approximately 0.1 micron (one ten-millionth of a meter) in diameter produce violet. Spheres about 0.2 microns in size produce red. Sizes in between produce the remaining rainbow colors. White or light opal: Translucent to semitranslucent, with play-of-color against a white or light gray background color, called bodycolor. 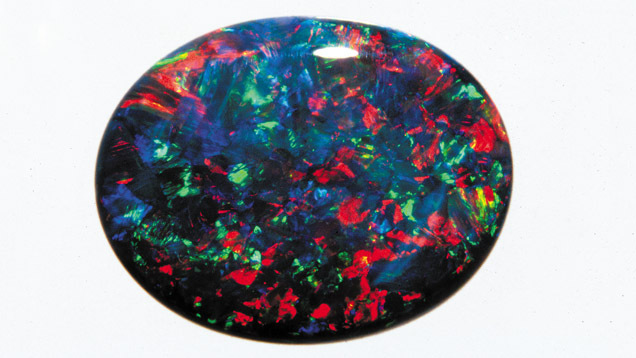 Black opal: Translucent to opaque, with play-of-color against a black or other dark background. 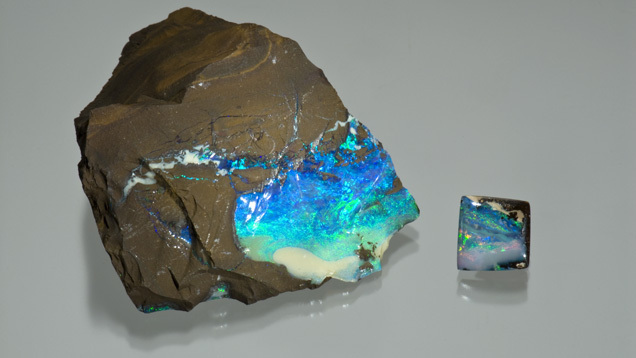 Boulder opal: Translucent to opaque, with play-of-color against a light to dark background. Fragments of the surrounding rock, called matrix, become part of the finished gem. Crystal or water opal: Transparent to semitransparent, with a clear background. This type shows exceptional play-of-color. The rough specimen is a thin seam of boulder opal on sandstone host rock. 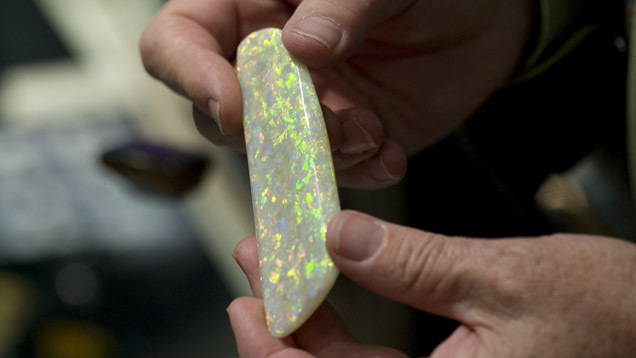 The 3.47-carat boulder opal tablet was cut from a similar piece of rough.